WALLKILL—After years of having to take turns crossing the Wallkill River between Hamptonburgh and Wallkill, traffic went to two lanes after the Scotchtown Avenue Bridge on County Route 83 was finally opened. 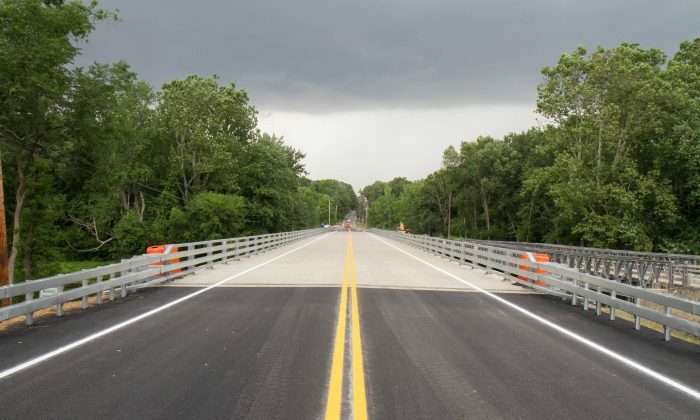 Construction began on the 330-foot bridge in 2007, and while there were delays in the initial stages, the project finished on schedule, said Chris Viebrock, the county’s commissioner of Public Works. Officials from federal, county, and state governments held a ribbon cutting for the bridge, and construction workers took down the orange cones and the detour signs on Friday, July 1. Those inside the first few cars to go over the new bridge shook hands with the construction workers and thanked them for their work, said County Executive Steven Neuhaus. During the construction, a temporary one-lane bridge called a Bailey bridge was put over the Wallkill River to allow traffic through, albeit slowly. County legislator Michael Paduch, who represents Middletown and Wallkill, said his constituents would often complain about the slowness of the one-lane traffic and were anxious to see it go back to two lanes. The county estimates almost 5,000 vehicles go over the bridge each day. The $5 million project was funded 80 percent by the federal government, 15 percent by the state, and 5 percent by the county. Neuhaus said the county is working on repairing other bridges right now, trying to play catch-up with aging infrastructure that has been upgraded too slowly. He said with the roughly 150 bridges the county has, it should have been upgrading two a year but were only doing about one a year. It took 7 years before the Scotchtown Avenue Bridge was on the radar for repair, Neuhaus said. “This is embarrassing. We fix bridges faster in Afghanistan and Iraq quicker than here,” he said.